A how to video about weathering model train cars(I use n-scale, but these techniques can be used on all scales). 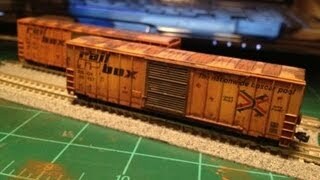 I cover everything from needed supplies to step by step instructions on how I weather my train cars. Use Walmart or Michaels craft acrylic paints and mix it to a ratio where the paint is almost like a creamer or milk. Please subscribe, like, comment and share my video amongst your friends.